Designer kurtis are a very good choice for any occasion be it home or office, formal or casual. Fine fabric is used to manufacture these designer kurtis. Apart from the heavily embellished kurti, these simpler versions of the kurtis provide an elegance with simplicity. This kurti fabric printed in trendy colors makes it a must have this season. Being amongst well known organizations in the field of apparels & textiles, we are engaged in manufacturing, supplying and exporting a wide array of women's Kurtis.These are highly appreciated by our client world over for their unique design and quality.The designer kurtis are most preferred by the fashion lovers.These designer cotton kurtis presented in exclusive range will definitely add elegance to your beauty. The designer kurtis are most preferred by the fashion lovers. 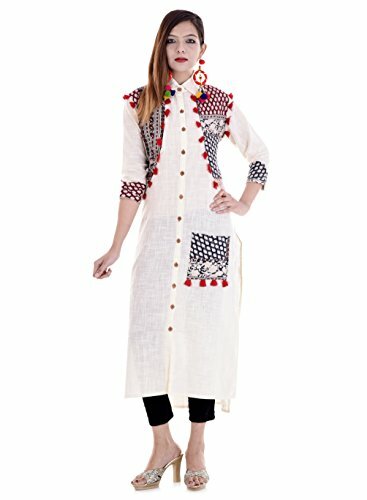 These designer cotton kurtis presented in exclusive range will definitely add elegance to your beauty. SIZE CHART GUIDE: - The measurements in above Size Chart are considered as body measurements. The Ready Garment Size at Bust for all the above sizes in "Inches" will be as following, (S-36); (M-38) ;( L-40) ;( XL-42); (XXL-44). If you have any questions about this product by Vihaan Impex, contact us by completing and submitting the form below. If you are looking for a specif part number, please include it with your message.